Breezeway Iris Garden is a family business started by George Bacon and his mother Doris Bacon. The garden is located just outside of Madison Wisconsin at the family home on 80 rolling acres we have owned since 1960. Our current house was built in the spring and summer of 2003 and the first Iris were put in the beds surrounding the house that August. Many were brought from the farmhouse, at the foot of the hill, to our new home. The Iris grew so well in their new location that our beds were soon overflowing with increases. That led to our first Iris “garage sale” and the start of Breezeway Iris Garden. Doris always had Iris in her garden ever since I can remember. I grew up helping Mom care for her Iris and was fascinated by their amazing display of blossoms every June. Breezeway Iris garden is the culmination of our lifelong love of Iris. Doris has now retired but is still enjoying the iris garden and helping with our open house, garage sale and checking in orders for shipping. The name, Breezeway, is one long associated with our family. For many years we raised and showed horses as Breezeway Arabians - named so by Doris due to the strong breeze always blowing across our acreage! 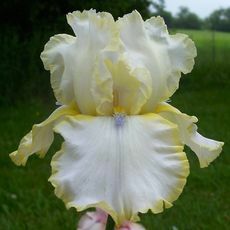 Currently we sell all classifications of Bearded Iris. Each year we acquire and plant hundreds of new varieties from award winning hybridizers and see how well they perform in our garden. If they prove to be hardy and floriferous we offer them for sale. Mom and I are active members of the Madison Area Iris Society and encourage you to join the American Iris Society and become active of your local iris club. From hybridizer Jack Worel, 2015. Light creamy white standards with narrow yellow edge over light creamy white falls with yellow shoulders and narrow band.